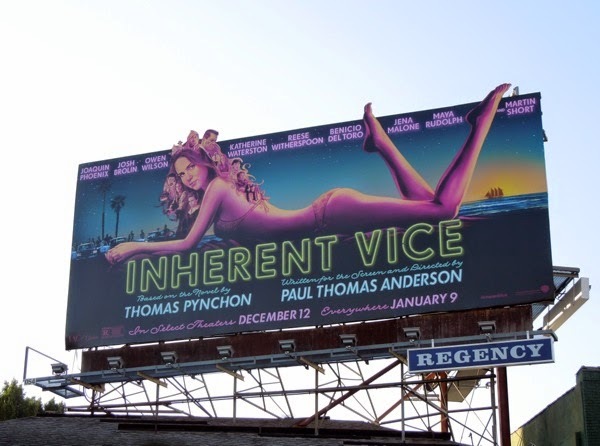 Are you ready to slip into the early 70's psychedelic world of surfers, stoners, hustlers and California crime noir, if so then Paul Thomas Anderson's latest film based on Thomas Pynchon's 2009 novel, Inherent Vice, is just the groovy movie for you. Joaquin Phoenix plays an ex-hippie, pot-smoking private detective who is asked for help by his ex-lover. When she and her billionaire tycoon boyfriend disappear, 'Doc' must investigate the case through a smoky haze of marijuana, clever disguises and alter-egos. 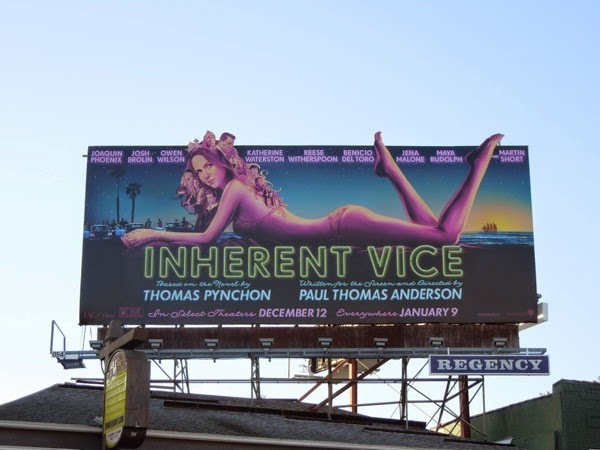 These neon and pink leggy billboards for Inherent Vice certainly have that California beach feel with a bikini-clad Katherine Waterson, who plays Doc's ex, 'Shasta', and her hair filled with the ensemble cast in the film help evoke the triply feel of the era. This special extension 'full body' billboard was snapped along Sunset Boulevard in West Hollywood on November 17 and 'legs' version snapped at Warner Bros. Studios in Burbank, California on November 22, 2014. 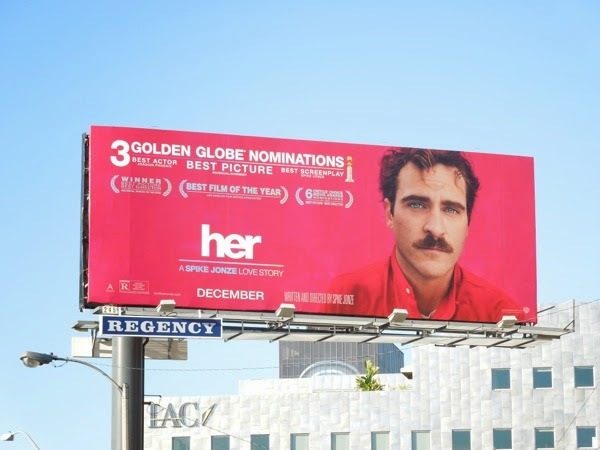 If you're a fan of Joaquin Phoenix, here's also a billboard from last December for the Oscar-winning movie, Her, although it will be interesting to see whether Inherent Vice will be too weird to garner any Academy attention this awards season. 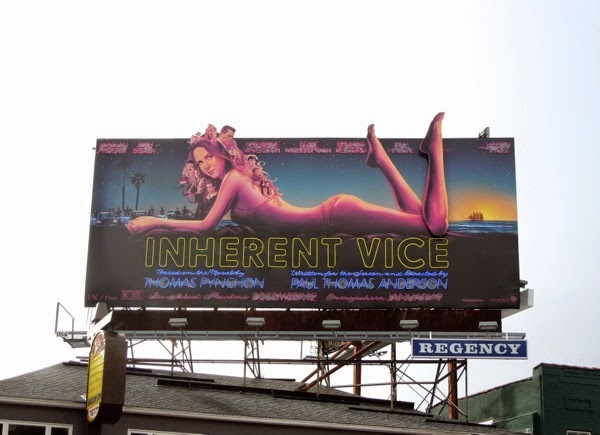 UPDATED: What a difference a storm makes, as Daily Billboard discovered that the Inherent Vice billboard along the Sunset Strip had received a fabulous makeover to help brighten L.A. after the rain. 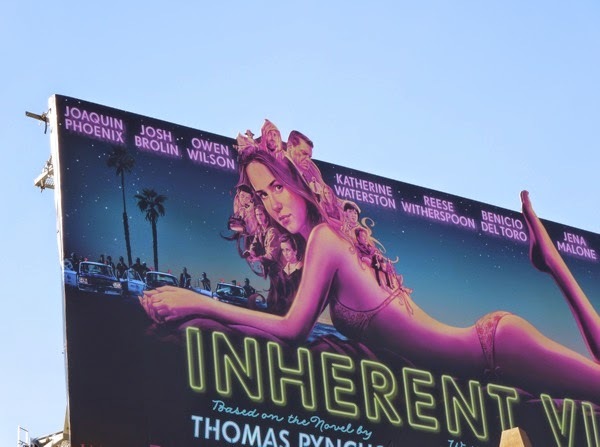 All the cast names are now in neon lights and the film's title is also in flickering neon lettering, but not only that Katherine Waterston's left leg now moves on this billboard installation. How fun is that, and not only can you see the leg move in these photos, but here's also short video of the moving leg mechanic on a gloomy December 12, 2014, which along with the flickering neon sign makes for a real spectacle. 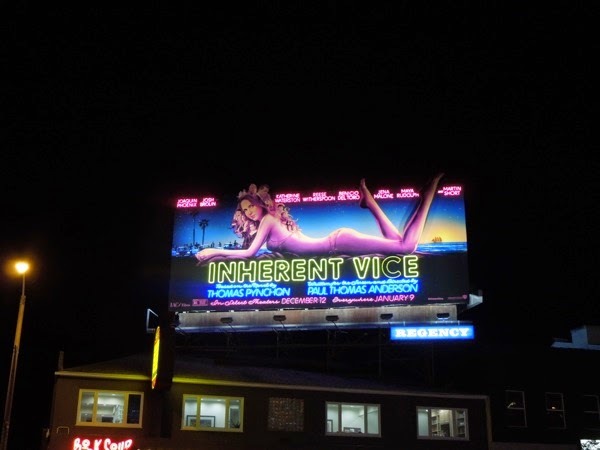 If you like this special Inherent Vice billboard which combines special lights and motion, be sure to also check out this neon sign billboard for the Footloose movie remake from September 2011. 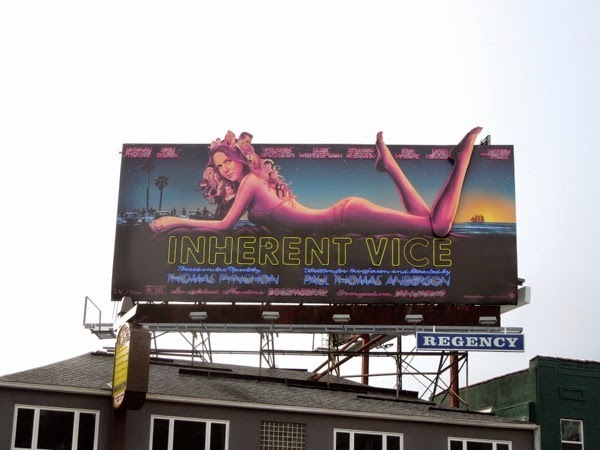 It certainly looks like Inherent Vice's marketing has kicked into high gear with this highly noticeable installation, especially as this billboard location doesn't get the best direct sunlight this time of year with the sun so low to properly showcase the ad, even though it gets the high volume Sunset Strip commuter traffic and this gimmick will work well at night with the neon signage. 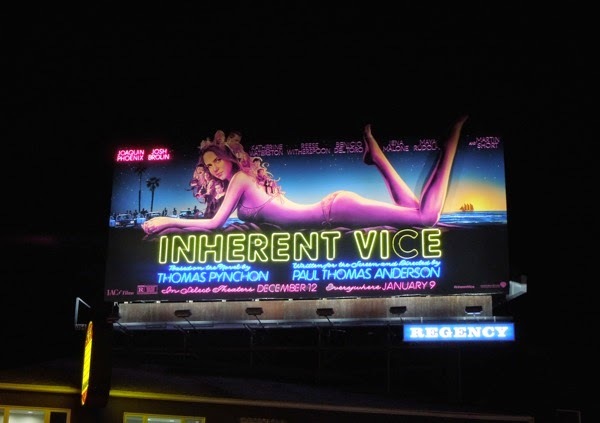 UPDATED: And speak of the devil, here's the billboard at night (photos and video), and that neon lettering works a treat in the dark. 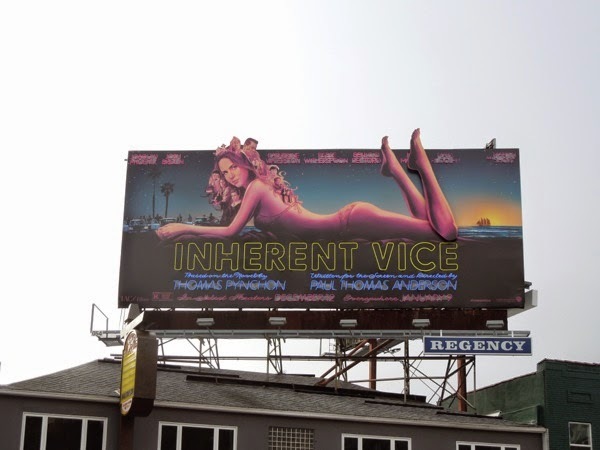 How can you not love the playful quality of this billboard and Daily Billboard feels it fits extremely well with the spirit of the movie. Kudos to all those involved with the execution of this installation project. Who needs Christmas lights when you have spectacular illumination like this along the Sunset Strip this holiday season.